Four upcoming concerts will put a spotlight on jazz music as student musicians from Missouri Southern offer a wide variety of finger-snapping, toe-tapping standards. 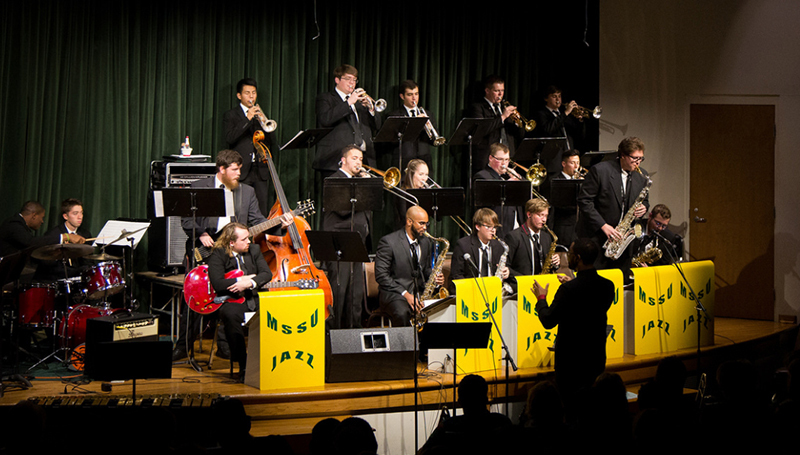 The Jazz Collective will perform at 7:30 p.m. Thursday, April 19, in Corley Auditorium. The collective is comprised of several of the university’s jazz combos who recently joined together to record a CD at Winterwood Recording Studios in Eureka Springs, Ark. A Jazz Standards concert is planned for 7:30 p.m. Wednesday, May 2, in Corley Auditorium. The Southern Jazz Combo will perform along with vocalist Bailey Roach, trumpeter Mansa Campbell, saxophonist Mark Knowles and guitarist Matthew Clark. The performance is free, but donations of canned good or other non-perishable items to donate to Crosslines Ministries are encouraged.